Arnold Schwarzenegger put his acting career on hold when it was discovered he had a in-no-way-surprising secret love child with his housekeeper. 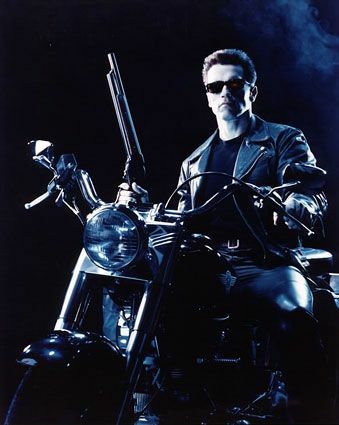 That threw a wrench into Justin Lin’s Terminator 5 but producer Megan Ellison, who now holds the rights to the franchise, isn’t going to sit around waiting until the public moves on to the next scandal and forgets that Schwarzenegger is no hero. With that in mind, What’s Playing has some interesting rumors to report on the film. First up, the new film may bring back original characters Kyle Reese and Sarah Connor but it may do so in a Star Trek-style alternate timeline fashion where new actors could play the roles and take them in a new direction. Since the franchise has always included some element of time travel, a fractured timeline wouldn’t be a crazy idea (especially since they already used that premise to spin off the short-lived The Sarah Connor Chronicles). That’s a solid way to reboot the franchise and it would be even better if they could just cut out Schwarzenegger entirely. But I could live with his casting if it didn’t mean another disturbing rumor coming to fruition. Hit the jump for more. What’s Playing also reports “this Terminator would mostly be anchored by a new, younger male lead (Paul Walker’s name keeps coming up – could he possibly be Lin’s pick for Kyle Reese? ).” While Lin and Walker have worked together on the last two Fast and Furious movies, the only time Walker has ever shown a spark of personality and charisma was in Running Scared and that was a ballsy film that took some serious chances. Lin has shown he’s a competent action director, but I doubt he’s going to shake-up the visual style of Terminator franchise and that will likely leave Walker as a wet dishrag protagonist. While it would be cool if the reboot could figure out a way to bring Anton Yelchin back into the fold to reprise his role as Kyle Reese, it looks like Terminator Salvation was effectively the end of that direction for the franchise and the only way forward is to look back. That’s why I have a problem with Schwarzenegger coming back. He’s an albatross hanging around the next of the new film and the series needs to grow beyond him. The compromise may be to reduce Schwarzenegger’s screen time in this movie, “so it’s less work and less of a commitment for him and thus, it’ll be easier to talk the big guy into doing something this year.” I can live with Schwarzenegger moving into a supporting role. I just don’t want another Rise of the Machines.